The Platypus - photo by "Rainbow606"
Monotremes are a kind of rare mammals which lay eggs. They give birth to live young. They can be found in Australia, Tasmania and New Guinea. This group includes the Platypus and the four types of Echidna (Spiny anteater). 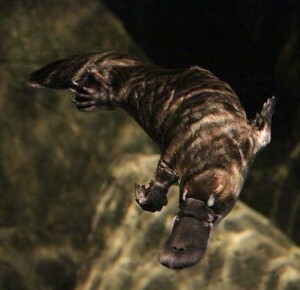 Like other mammals, monotremes are warm-blooded with a high metabolic rate, but not as high as other mammals. They have hair on their bodies. After the babies are hatched, they are fed with mother’s milk. Mothers have no teats, so the babies will just lick up milk that oozes from their mother’s skin. Adult monotremes have no teeth. They have a single bone in their lower jaw, three middle ear bones and beaks. They have extra bones in the shoulder girdle. They walk like reptiles, with legs at the sides rather than underneath their bodies. They lay tiny eggs. They will normally lay 2 eggs at a time. The eggs are covered with leathery shells like reptile eggs. An Echidna - picture by "KeresH"
The platypus spends much of its life in the water. Its webbed toes have no hair, a blue grey bill like a duck’s bill, waterproof short brown fur and a flat furry tail like a beaver’s tail. It has tiny ear slits, small eyes it can close its nostrils to keep the water out when it swims. It is between 1 to 2 feet long (30-60 cm) and it weighs between 3 or 4 pounds (1.3 – 1.7kg). It eats insect larvae, shrimp, frogs and fish eggs. Echidnas have black or brown hair, lighter coloured spines. It has tiny eyes and a tiny mouth with no teeth. It has a very long sticky tongue that it uses to catch termites and ants. 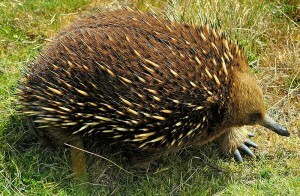 Echidnas are also between 1 to 2 feet long (30-60 cm). It has short legs with long heavy claws on feet and a pointy snout. 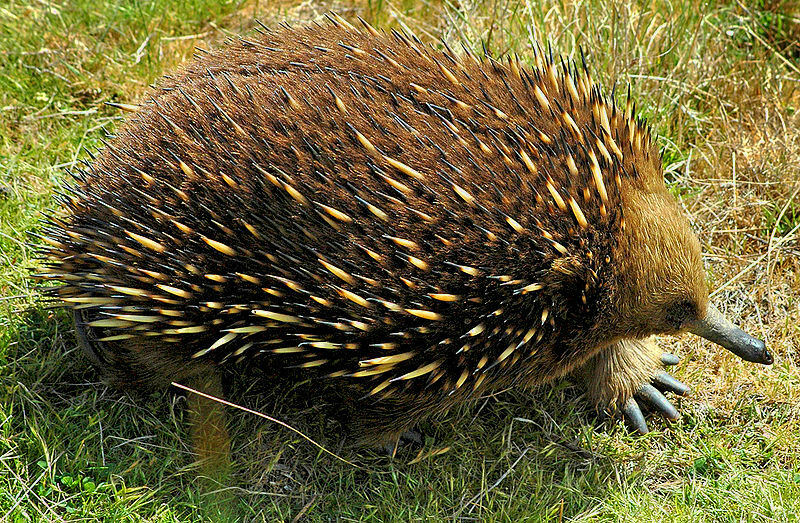 The biggest type of echidna, and the biggest monotreme of all, is the Western Long-Beaked Echidna.